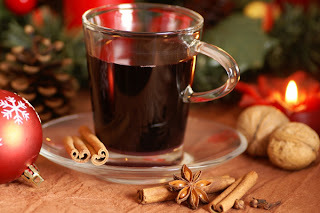 There are many mulled wine recipes, this one is simple. An even simpler way to make mulled wine is to purchase a bag of mulled wine spices and simply drop it in the wine before heating. 1 bottle (750 ml) of a dry red wine. Combine boiling water, sugar, lemon, cinnamon and cloves; stir until sugar dissolves. Add wine; simmer 20 minutes. Do not boil. Strain. Serve hot with a sprinkling of nutmeg.